More reason to give thanks today, Nov. 4. It seems all of our relatives have been accounted for. Thanks for your prayers and please keep in mind those families not so fortunate. We felt great relief and gave thanks this morning on learning that many of our relatives on the New Jersey shore are in the dark, but OK, with roofs and walls intact. Like many others who have their family, friends, hearts and homes in places hit by Hurricane Sandy, we worry for the ones we aren’t able to contact. Please keep them all in your prayers. It’s going to be a long recovery. 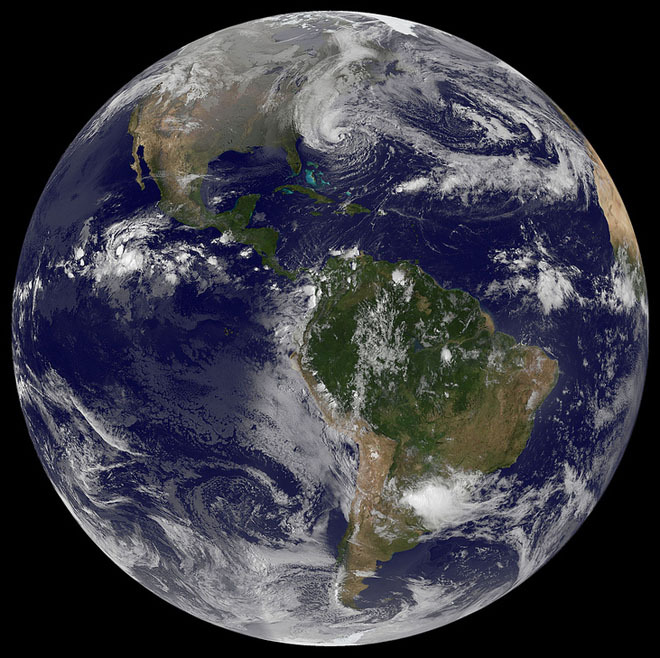 SANDY — Sandy’s size gets some perspective on this “blue marble” photo. 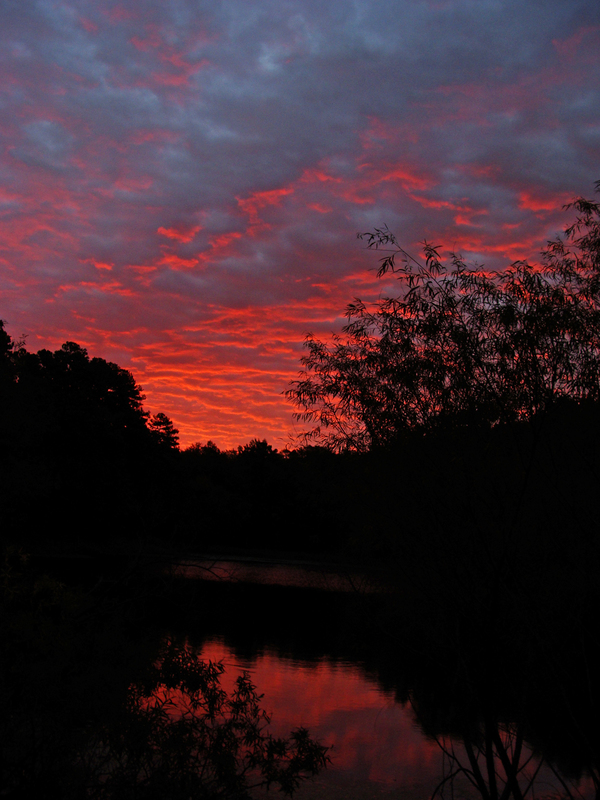 When people think of fall color, they usually think of the deciduous trees. But don’t count out the conifers. Come autumn, the cypress here turns a bright rusty hue, contrasting nicely with the other foliage. The bases broad bases and fluted columns that make up the trunk made these trees seem to date from another eon. 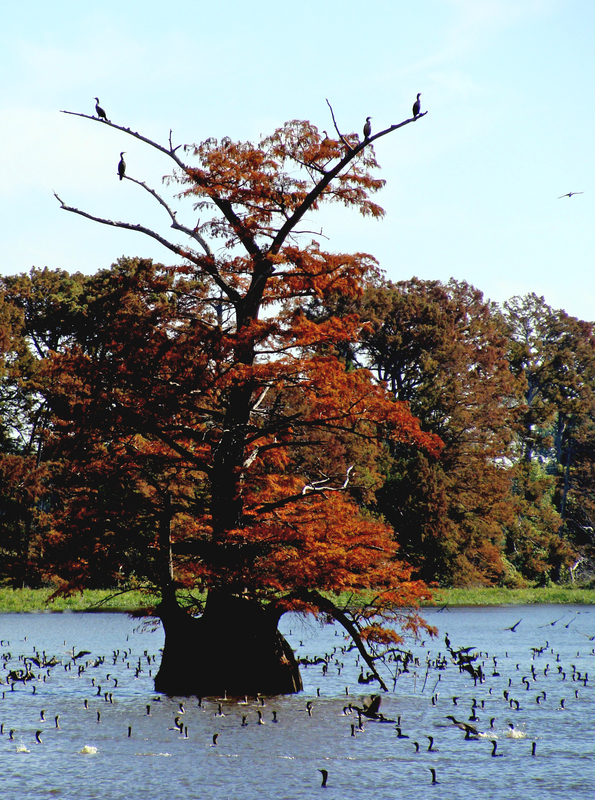 CYPRESS and CORMORANTS — Running parallel to U.S. 70 east of Little Rock is a strip of water surrounded by cypress. TREE FULL OF LIFE — Cormorants gather around the base and in the branches of this cypress. This week’s WordPress Photo Challenge prompt was “foreign.” There were so many lovely photos of faraway lands we fretted over what to post. Then by a bit of serendipity, we were taken on a test drive while waiting on our car to be serviced. During the test drive, we were “hijacked” to a gathering of automotive enthusiasts serving up pretzels, sausages, beer and showing off their lovely driving machines. Most were German; a few were English. All were foreign. It was the most memorable test drive we’ve ever had*. Below, a handful of shots of some of the beauties on display. 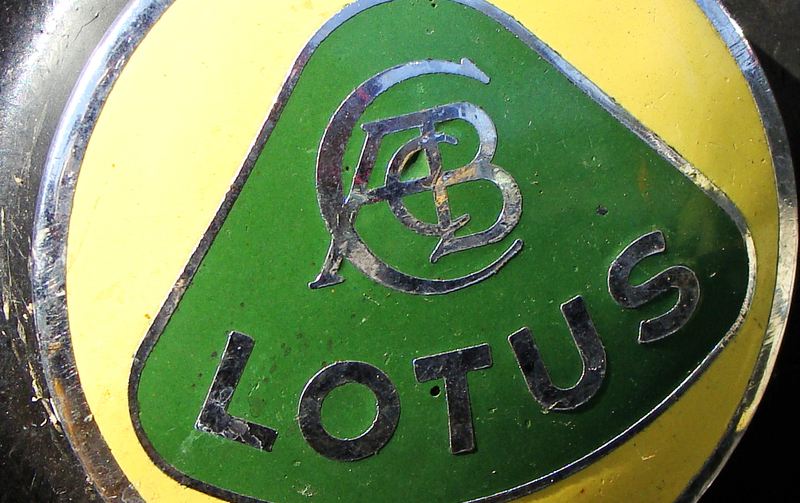 LOTUS BADGING — Under the hood of a Jensen-Healey. 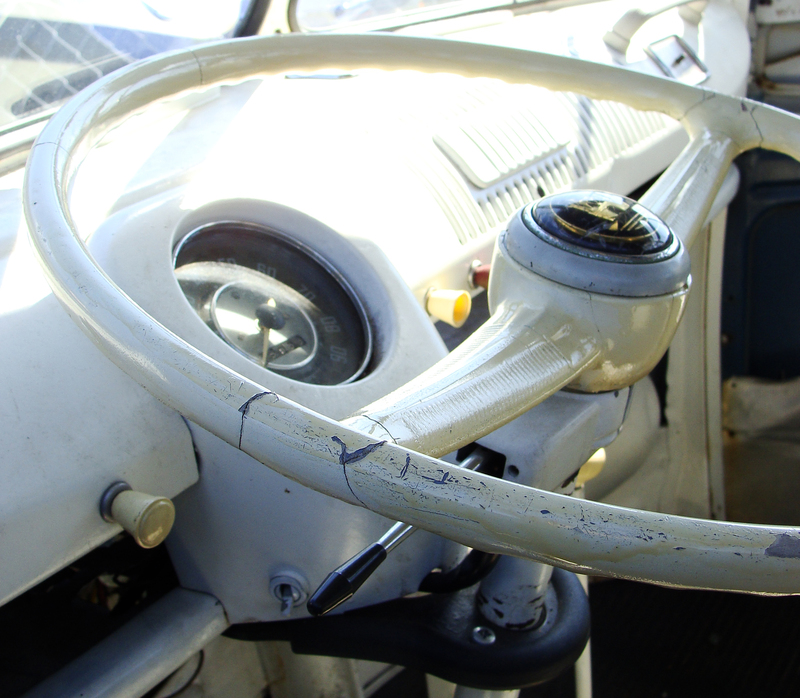 TAKE THE WHEEL — Steering wheel a little worse for wear in a ’66 VW bus. 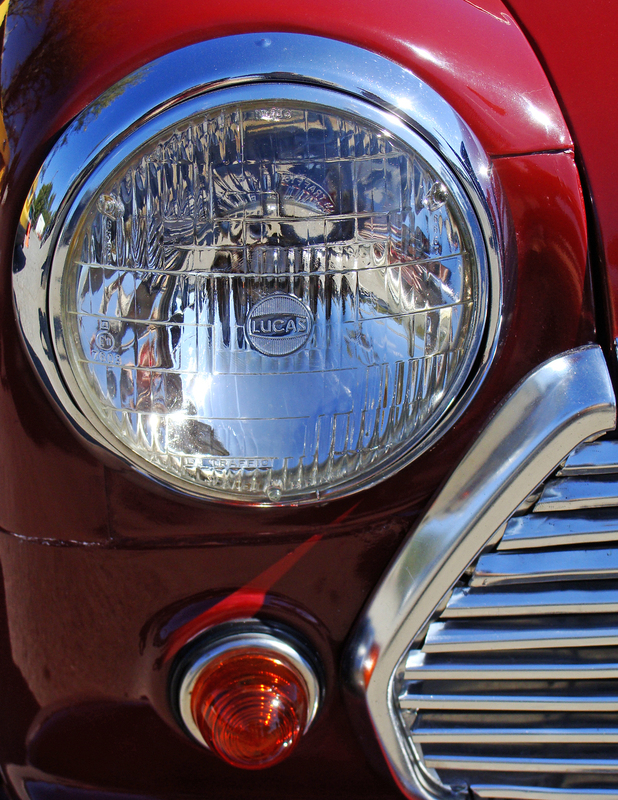 LIGHT THE WAY — Headlight and part of the grille of a restored Austin Mini — complete with 10-inch wheels. There were some lovely cars including a new BMW 1M, a 6-series shark, a Jensen-Healey ragtop, and a few tuned V-Dubs. *Why? 1) The new VW Golf R is a very hot little hatch, especially when 2) A former national SCCA champion driver is at the wheel giving it a 100 percent performance drive. LIGHT THE WAY — Headlight and part of the grille of a restore Austin Mini — complete with 10-inch wheels. POINTY SNOUT — A 6 Series M shark. The engine was immaculate. Every October, we look forward to the monarch butterfly migration. Two weekends ago, I spent a couple of hours in one of the gardens, ripping out the overgrown mass of foot-high grass and weeds, as well as the dried brown coreopsis and black-eyed Susan stems that were now wrapped tightly by a white morning glory-type vine. In the midst of the mess were giant goldenrods and bunches of a woody-stemmed, white baby’s breath-looking flowers, all lassoed and pulled to the ground by the little white trumpet vines. A few bug bites and a lot of sweat later, the undergrowth was cleared away and the nectar-bearing goldenrods and white mystery flowers freed and staked to stand tall as a way station for the monarchs’ annual southward migration. Today, they came to the mountain. 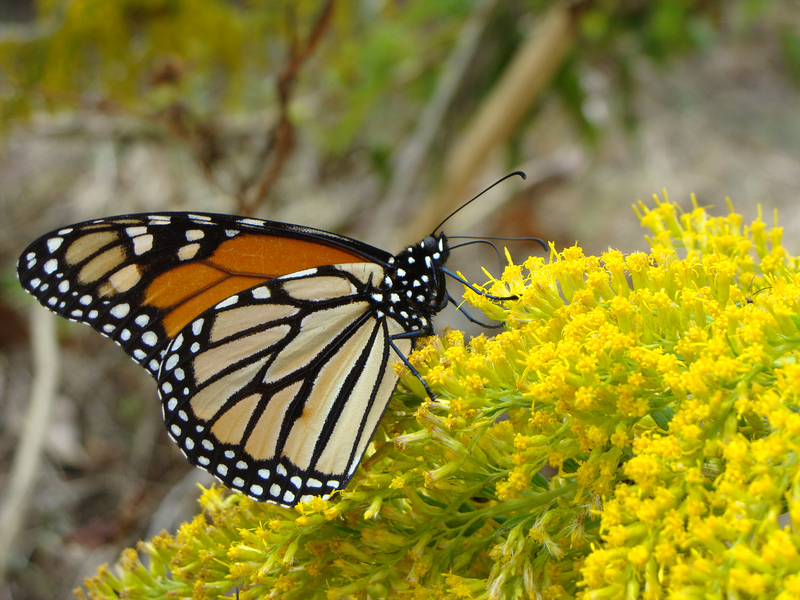 MAKING A PIT STOP — This monarch spends time gathering nectar for its long journey south. WINGS DE DEUX — Monarch and gulf fritillary in the goldenrod. WAY ‘TWO’ ORANGE — Gulf fritillary and monarch making their way around the blooms. JACKPOT! — Five butterflies — monarch, gulf fritillary, American lady and a couple of dusky hairstreaks. RIDING THE WIND — All of these winged creatures were hanging on tight as their goldenrod perch was buffeted by mountain winds. THEY’RE EVERYWHERE — Wasps, bees, pollinators of all types were making the goldenrods buzz. Fine feathered friends found in the photo files. RUFFLED — Wind ruffled sparrow awaits handouts at a lakeside restaurant in Hot Springs, Ark. JUST THE LOOK — Something about the framing of this made this fellow look malicious. Taken by my better half at the Little Rock Zoo. IN THE PINK — Flamingos at the Little Rock Zoo, also taken by my better half. COUNTY FAIR — Rooster awaits judging at the county fair. FILCHED FROM A FINCH? — Goldfinch feathers on the windshield with trees and clouds reflected in the background. Sure like this new rectangular gallery — it certainly appeals to the Mondrian layout person in me. And I just discovered that where the gallery robot puts the photos is controllable by doing some renumbering under “order” when you’re in the upload box. While page design purists may “grrr” at the faces looking off the page, I decided to leave the images unflopped. That would be too much like work. So there. Darn it. More rodents-are-cute photos. Top photo looked better in the view finder, but still like how graceful he appears, even with motion blur. 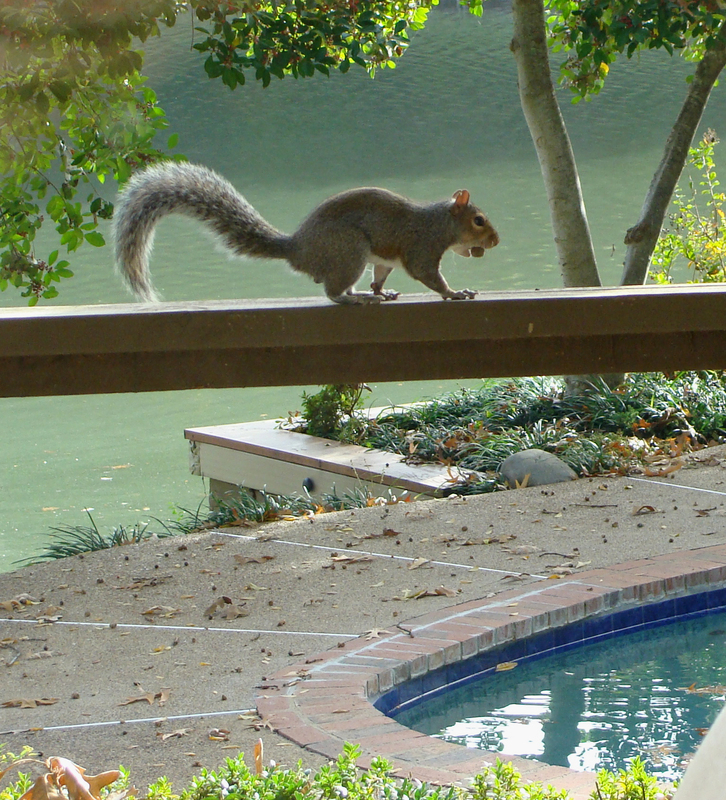 LEAPS AND BOUNDS — Squirrel bounds along the porch railing. NUTTY — Squirrel pauses with his catch of the moment. And while he’s gathering his breakfast, note the big tick on his left “arm” also getting breakfast, lunch and dinner. We’re surrounded — in a good way — by tens of thousands of acres of trees. However, two years of drought put the woods of the Ouachitas* under stress, the kind of stress that can leave trees vulnerable to disease, insects, death and wildfires. As trees went dormant to cope with the lack of water, summer’s leaves tumbled to the ground en masse, looking like fall, but with triple-digit temperatures. So there was plenty of speculation about whether there would be any leaves left for the state’s forests to give its annual foliage show. The trees prevailed. THE BIG PICTURE — Ouachita colors reaching their peak (?) this morning. SUMAC AND SORREL — Nicely contrasting pair. WINDOW INTO THE CANOPY — A riot of colors backlit and in shadow. RED AND YELLOW – Contrast against the pale Stanley Shale. LAVENDER – Blooms in the understory. HICKORY LEAVES — Beautiful yellow with green veins. Sometimes beauty can emerge from even the most ignominious end. This damselfly past fell from the plastic cover for the garage light while replacing a bulb. Low-slanting fall sunlight pouring through its wings spilled an iridescence onto the white paper below it, like the most subtle stained glass. Too subtle, truly, for our pixel catchers to render. 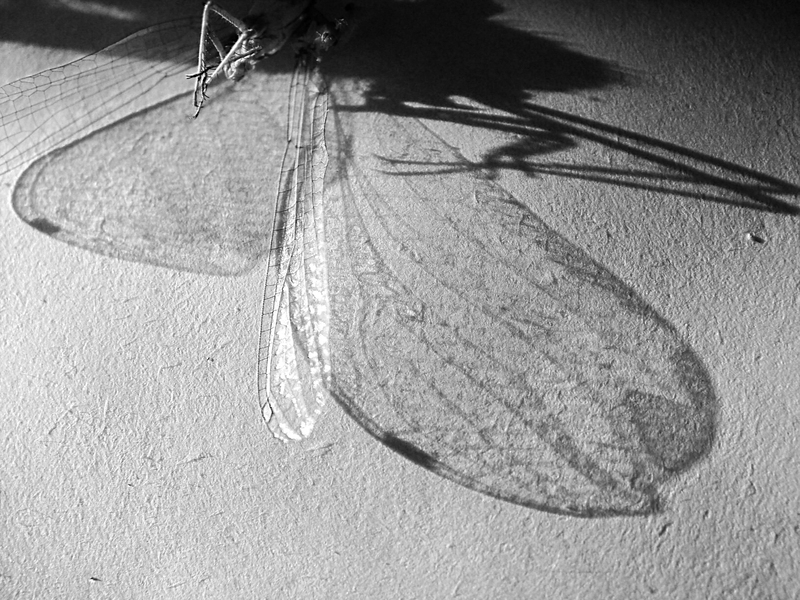 DELICATE — The wings of this damselfly are delicate in reflection and shadow. 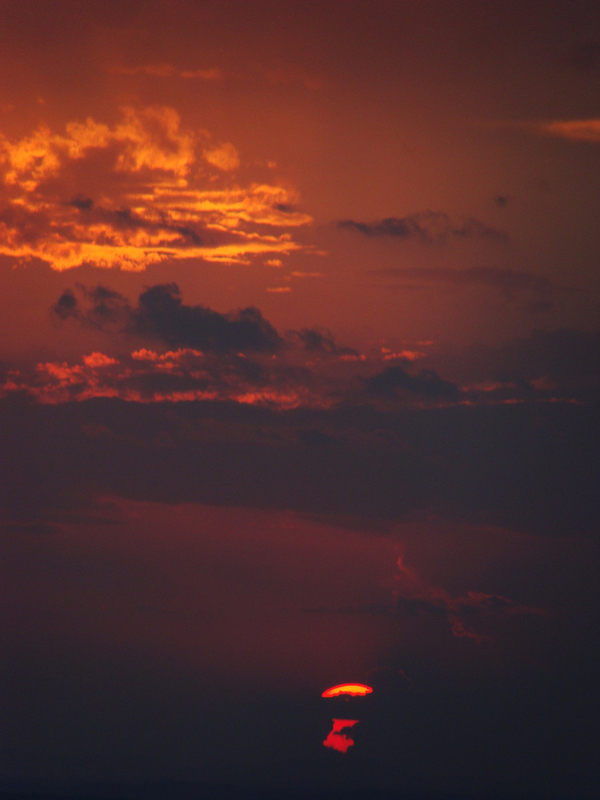 Lots of sun-made silhouettes in this week’s challenge, including our first entry. Let’s give the moon its due. 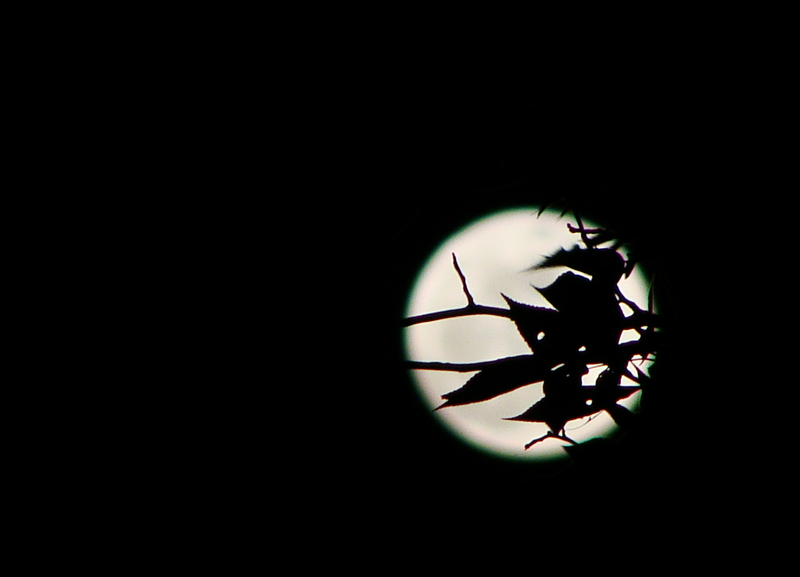 NIGHTTIME SILHOUETTE — May 5 “Super Moon” backlights these leaves and branches.